So you want to go over the top this time and buy her a luxurious gift. You’ve done all your homework, and read all the guides on how to buy a perfect luxury gift for her. Kudos for that! But before you buy that gift for her, let’s discuss an innocuous question that might help you make a better decision on what gift you should buy for her. The meaning of luxury has changed drastically over the years. Earlier luxury was related to how expensive an item is, its brand and the status symbol it represented. But as we have evolved over the years, luxury has become more about heritage, exclusivity, access, and experience. And luxury gifts have become more about items which are unique, thoughtful and beautifully functional. Thus, buying a luxurious gift doesn’t mean just buying an expensive item in the modern world. Just keep this in mind while buying a luxury gift for her. up her overall style and look – A luxury hand painted silk scarf, which can be tied around the neck or on the handle of the handbag to add a chic twist. 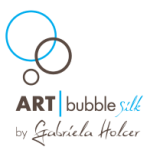 Or in some cases, you can even get the luxury hand painted silk scarf framed as art at your home. 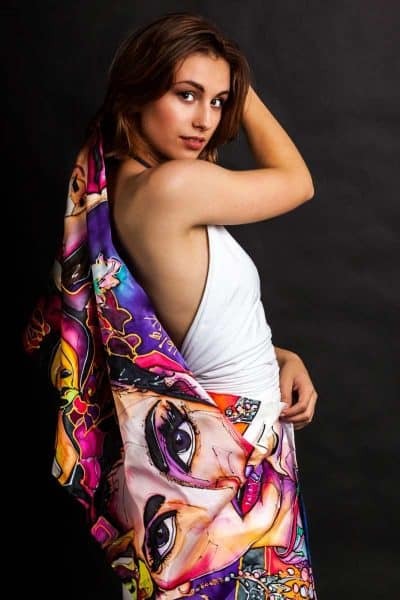 A hand painted silk scarf is a perfect luxury item for gifting her as it conveys that you are thoughtful and you have put in a lot of time and effort to craft something unique for her. And to be honest, who doesn’t like to own something that is exclusive to them. Silk fabric lies at the heart of the luxurious feel that the hand painted silk scarves offer. Having thousands of years of history behind it, silk is highly acclaimed for its extremely soft, lustrous nature that is at once both versatile and durable. And the protein like structure of silk makes it least likely among all the fabrics to create an allergic reaction. To top that of silk has a natural temperature regulating property that means it acts warm and cozy in winter and comfortably cool in summer. These innumerable advantages that silk offers have rightly earned it a reputation of the queen of fabrics. Also, for artists like me, it acts as a perfect canvas to paint our hearts out and create something beautiful and practical. The mere act of adding a personal touch to anything conveys a simple meaning to the receiver – “You care.” And the fact that you want to give the gift to your better-half makes it all the more important to personalize the gift that you are buying for her. 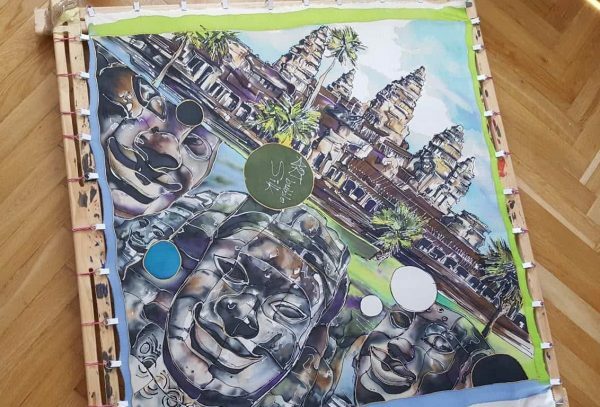 A hand painted silk scarf can be personalized to any extent – be it a simple painting that she loves or be it the place where you first met – everything can be captured on the silk canvas. Just hit me up and we can brainstorm on what should we design on the silk scarf to make your gift memorable. Also, let me know your definition of the luxury gift in the comments section below.